Hatha Yoga is the most widely practiced form of yoga worldwide, concentrating on physical health and mental well-being. 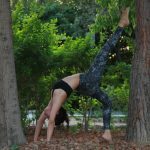 Hatha Yoga uses body postures (asanas), breathing techniques (pranayama), and meditation (dyana) with the goal of bringing about a sound, healthy body and a clear, peaceful mind. Hatha Yoga postures stretch and align the body, promoting balance and flexibility.